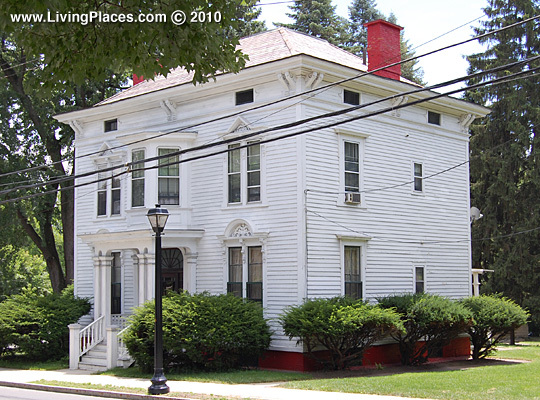 Waterford Village offices are located at 65 Broad Street, Waterford NY 12188; phone: 518‑235‑9898. First settled around 1633, the Village of Waterford was formally incorporated in 1794, making it the oldest incorporated village in the county. Its location at the junction of the Hudson River and the Mohawk River (major transportation routes since the earliest period of settlement) and the waterpower to be derived from the rivers at this location combined to produce a community exceptionally rich and diversified both as to historical associations and architectural heritage. Although imbedded in a matrix of urban and suburban growth, the village has retained its 19th century character, cohesiveness and feeling of intimacy to the present day. The Village of Waterford is located at the junction of the Hudson and Mohawk Rivers. It is in an area where three cities, Albany, Schenectady and Troy, are gradually merging and taking on the aspect of a megalopolis. The village is bounded on the east by the Hudson River and on the south by the Mohawk River. The Barge Canal forms a portion of the community's southern boundary and the Old Champlain Canal, still filled with water, bisects the village. A steep bluff to the northwest and a marsh to the north contribute to a definitive geographical delineation of the extent of this community. These geographical features also contribute much to Waterford's "sense of place." Manley, Doris Vanderllpp, Waterford Village Historic District, 1976, nomination document, National Park Service, National Register of Historic Places, Washington, D.C.